Monarch Beach Golf Links Hole 2: This par four features a 90 degree dogleg left around a huge bunker. From the back tees, carrying that bunker is a difficult proposition, so the tee shot must usually be placed between it and the lake to the right side of the fairway. From there, the approach is to a green with a steep slope behind it and large bunkering short. From tee to green this is a difficult hole. 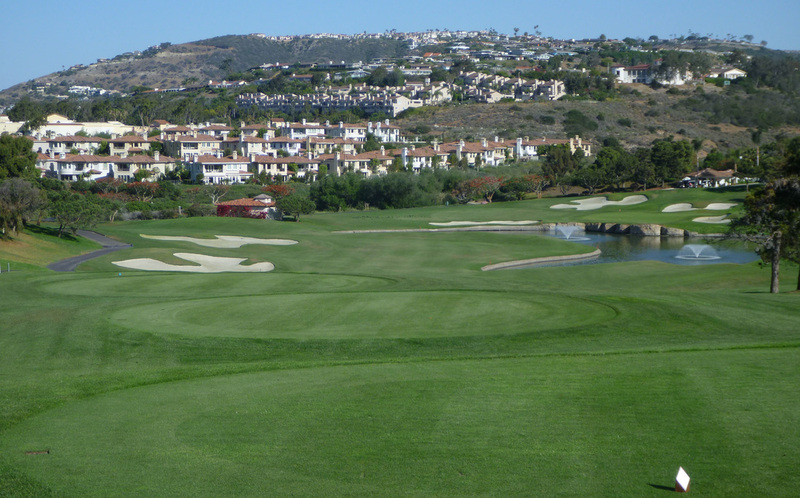 Monarch Beach Golf Links Hole 3: The signature hole is a short, dogleg left par four where all that is needed are two accurate mid or short irons. However, there is temptation to cut the corner and go for the green, or just leave a chip to the tiered and heavily undulating putting surface. However, there are bunkers scattered throughout and anything that flies too far right on either shot can find the beach, which of course is bad news. Monarch Beach Golf Links Hole 5: This difficult par three features a lake to the right of the green and an unforgiving bunker to the left. The tee shot (at approximately 200 yards) must be threaded between the two to find the very large green, with distinct levels depending on pin position. 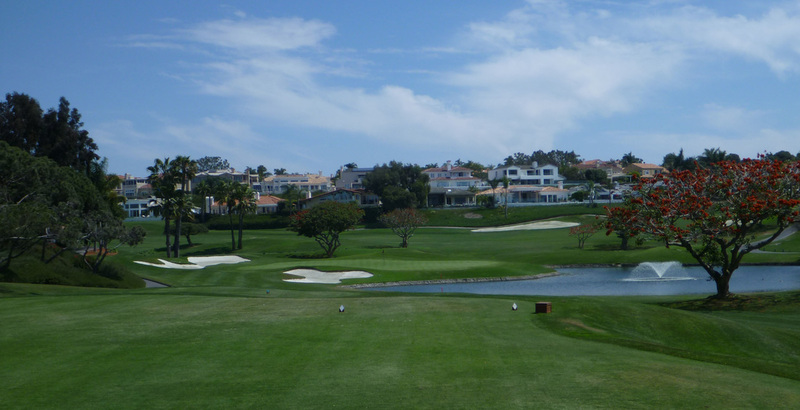 Monarch Beach Golf Links Hole 7: At over 600 yards from the tips, this par five is a beast, with three very difficult shots. There is a creek that runs right down the middle of this hole. The tee box is on its left and the landing area is on its right. The fairway is narrow and has bunkers and a hillside on the right. The second shot must then either be layed up short of the creek or the player can cross back over to the left side of the creek with a long and accurate second shot. The green lies on that side of the creek, nestled between it and more bunkers. 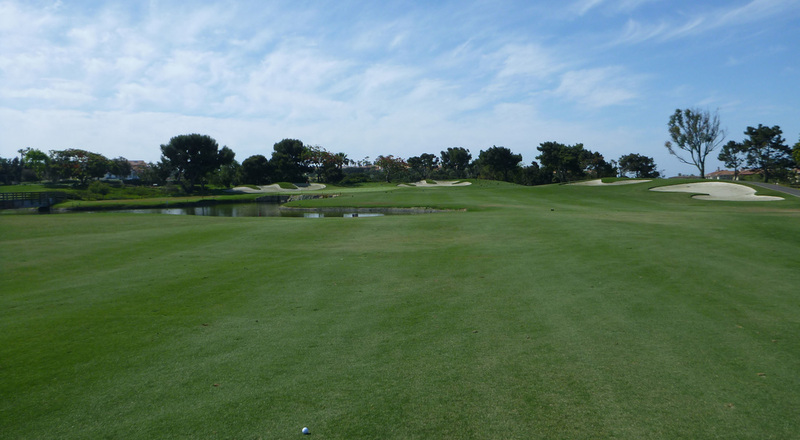 Monarch Beach Golf Links Hole 8: This extremely tight par four is nasty. The tee shot must be put between the OB left and the steep downhill bank to the right of the tiny, bunker-laden fairway. From there, the approach must cross a series of deep bunkers to a wide green that is tough to putt. Monarch Beach Golf Links Hole 9: The drive on this par five can't go left up the hillside or right down the hillside and either has to stay short of, fly (tough to do) or squeeze between the two fairway bunkers. From there, there is a lake to the left of the fairway and short of the left half of the green that will be in play on those shots. Monarch Beach Golf Links Hole 13 (left): The best hole on the back nine is a short par 3 peninsula green with a large bunker placed in what would be the bail-out area. The green is very large and deep, making distance control important to get a birdie. Monarch Beach Golf Links Hole 14 (below): This downhill par four has great ocean views and doglegs left around big trees and a large bunker. A big drive can cut the corner to leave a wedge but there is OB left and lake for a drive that is too big and a little right. The green is wide and well protected by sand. Monarch Beach Golf Links Hole 15: This par three is similar the thirteenth, but a little easier, as there is more bailout room left and long. There is, however, a big tier separating the left and right portions of the putting surface.